FrozenCPU.com 20-Pin Internal Female USB3.0 to Internal Male USB2.0 Cable Adapter (OCU44) The FrozenCPU.com 20-Pin Internal Female USB3.0 to Internal Male USB2.0 Cable Adapter allows you to plug your chassis USB 2.0 cable into your motherboards internal USB 3.0 header. This is a very handy adapter if you have just upgraded your board but want to use your existing USB 2.0 case. Cougar Deathfire EX Gaming Hybrid Mechanical Keyboard and Mice Combo Hybrid mechanical switches and anti ghosting technology join the mouse’s adjustable DPI, and 1000 Hz polling rate to provide quick, accurate and reliable responses for your commands. In addition, 8 backlight effects to make your gaming life more glorious. Akasa Vegas AK-FN091-RD 120mm 1200RPM Red LED Ultra Quiet Case Fan Akasa Vegas LED fan provides subtle system illumination and ultra quiet acoustics. 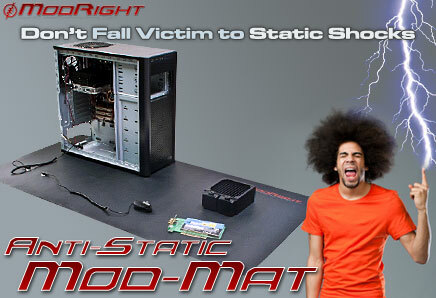 The ModRight Super Large Anti-Static Mod-Mat & Assembly Surface is the first full anti-static mat with enough room to complete your entire assembly on! The oversized Mod-Mat is a huge 1200mm x 600mm which is over 47" x 23". This allows plenty of room to complete your entire build on without worry of static or scratching priced hardware and parts. The anti-static surface is safe for ALL COMPONENTS including your motherboard, VGA cards, RAM and any other electronic parts. What Fan Manufacturer Do You Prefer?